Accelerate Bush Bean | Gurney's Seed & Nursery Co.
SpacingPlant 1 inch apart and thin to 2 - 2 inches apart, in rows 24 to 36 inches apart. 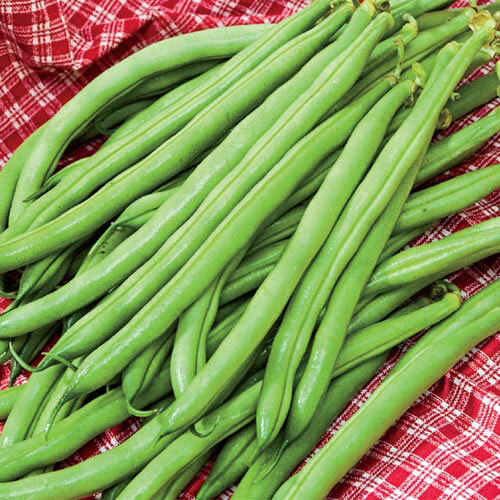 Fruit6 1/2 inch beans, stringless. Seeds are white. Soil RequirementsWell-drained, rich, loose fertile soil. Seed CountApproximately 150 seeds per packet. CommentsThis large bean will rev up your garden with heavy yields of 6.5" high-quality beans. Exceptional for canning and fresh eating, Accelerate has excellent cold vigor and is resistant to BCMV and root rot, tolerant to brown top and curly spot. Easy-to-pick beans freeze well for "fresh" beans all winter long. Developed by Pureline Seeds in cooperation with the University of Wisconsin, Accelerate is a large bean selected for heavy yields and disease resistance. Excellent cold vigor promises superior emergence and performance even in less than ideal conditions. Heavy yields of delicious, high quality 6 1/2 inch beans are great for fresh eating, freezing and canning. DepthPlant seeds 1 - 1 1/2 inches deep.